Hello fellow bloggers. How’s life? Hope everyone is enjoying their summer and enjoying the last few weeks of it before the kids head back to school. Unfortunately we haven’t gone anywhere or taken any real vacation time as a family. But we managed to steal a few random days here and there to spend with the kids and take day-long road trips. Can’t express enough how much I truly enjoy spending time with my family. My hubby and kids mean the world to me and every moment we get to spend together whether it’s in front of the tube watching a movie or out an about, it simply doesn’t matter what we are doing or where we are doing it, so long as we are together. So lately I’ve been busying myself with small projects here and there. 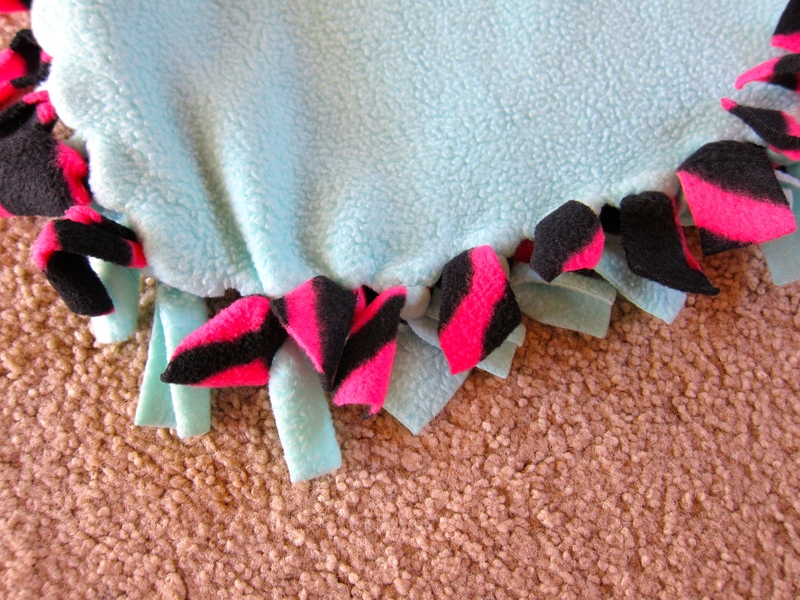 Recently my daughter asked me to make her a fleece tie blanket. So we waited for the sales and then headed over to Joanns to pick out out some fun fabric to work with. 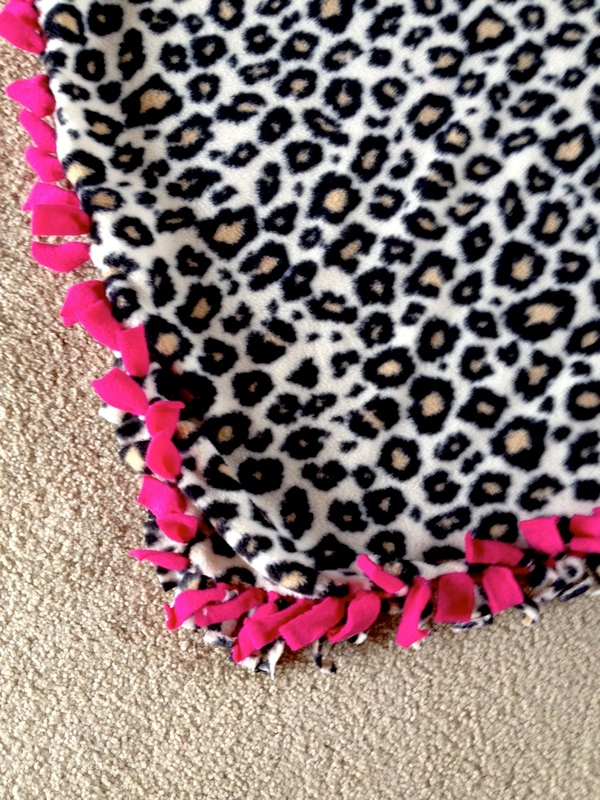 What I liked about making this blanket was the fact that you don’t have to break out the sewing machine. Not that I don’t like sewing, I do, I just don’t sew as often as I used to or would like to. I guess I’m all over the place when it comes to crafting. I’m a bit scattered if you will. One day I like knitting, the next crocheting, then the next paper crafts or card making. You just never know what will pop out of my creative head..lol! I really enjoy working with my hands and creating pretty things for people to enjoy. My dad worked as a metal machinist for many years. He operated various types of machines that he used to cut and shape metals into specific pieces or parts to be used in industrial settings. I know it was work that he took great pride in and enjoyed it very much before he retired. I recall him showing my mom parts that he’d made and explaining what they were for like a kid does when he brings home a project from school. I sometimes compare myself to my dad and believe that I get my desire to work with my hands from him. My mom was a crafty chic back in her day too. I remember as a kid she would sew dresses for me and knit sweaters for the family. I can’t help but put my hand on my chest as if clutching my heart in pain when I recall all the times I begged my mom not to make me wear that “ugly” sweater to school. I was only 9 or 10 at the time and never appreciated the labor of love that was put into such a precious gift. Unfortunately that beautiful ugly sweater my mom knitted as well as other dresses she had sewn for me were stored away for years before they found their way to the goodwill. My dad however saved a beautiful sweater she had knitted for him. Even though he doesn’t wear it anymore (fits him a little too snug now) he has kept it all these years and shows it off proudly whenever we reminice old times. He calls it his “precious gift”. My dad has a very rough edge to his personality so for him to say something so sweet about something my mom made for him, means a LOT to her. 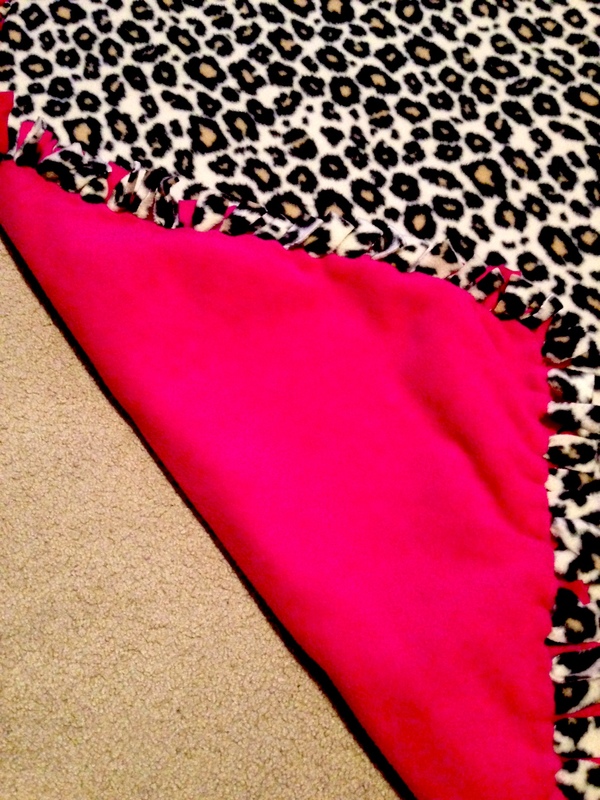 Anyhoooo….back to the fleece blanket…lol! Sorry I tend to get off topic sometimes. 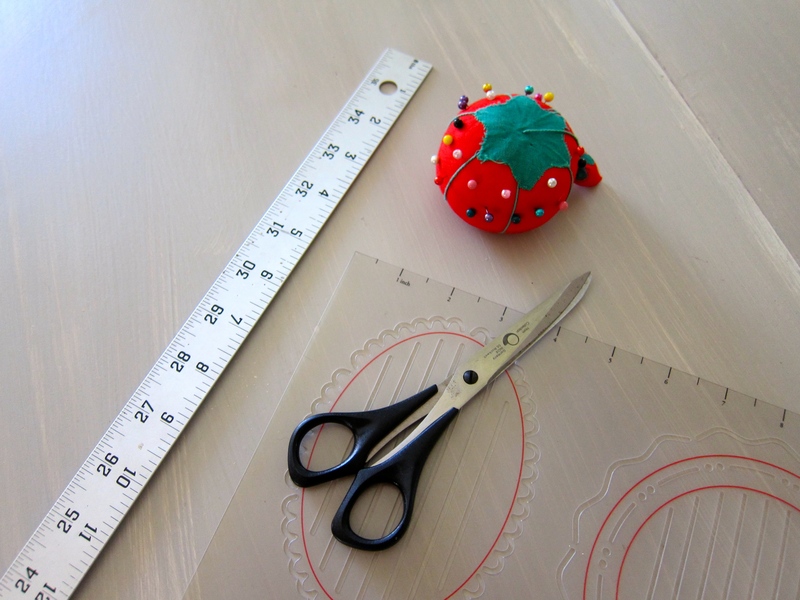 I guess I just wanted to share some background on why I like crafts so much. 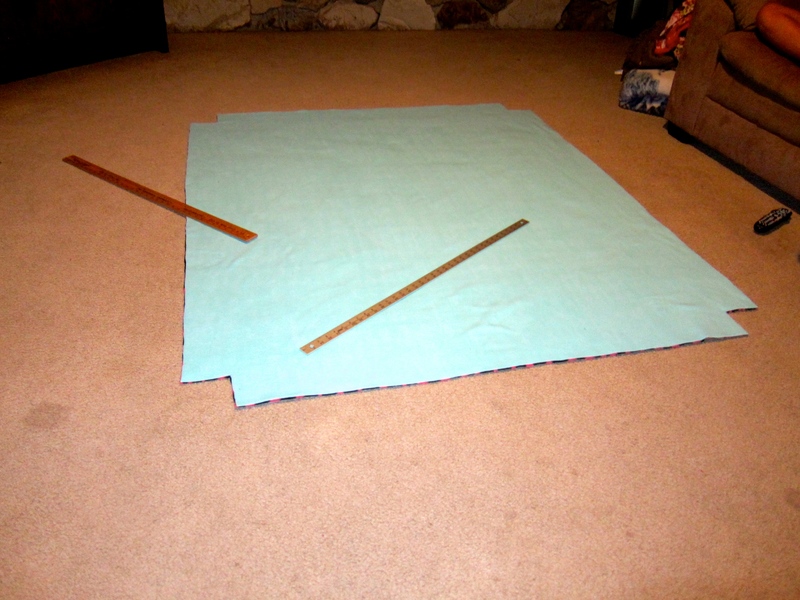 Something you can use to cut 4 x 4 size squares from each corner of the blanket. I just happen to have this clear plastic template I had ordered from Creative Memories back when I used to do a lot of scrapbooking. 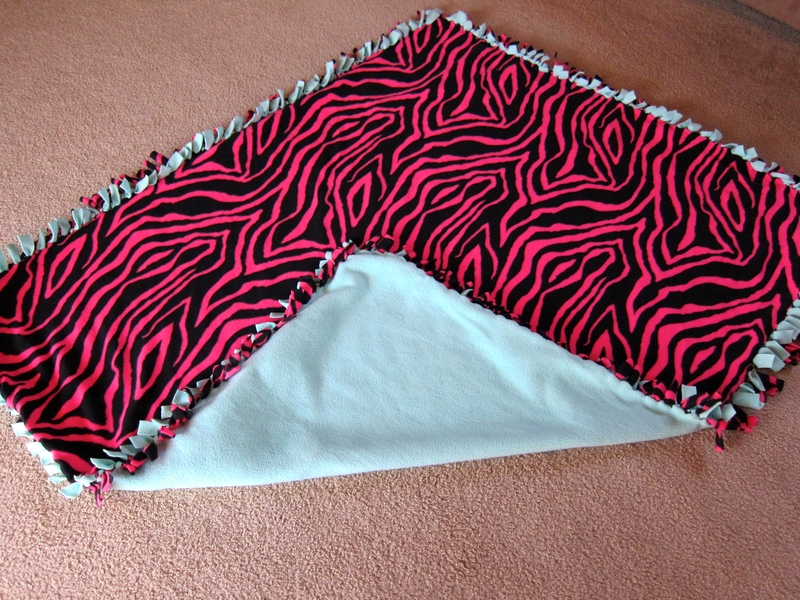 And of course patterned fleece as well as a contrast solid color fleece in the size you prefer. I bought two yards worth of material to make a good size blanket. But of course it’s up to you on how big or small you want your finished project to be. When you have your fleece lined up together be sure you have both pieces with the wrong or dull sides facing in to each other. 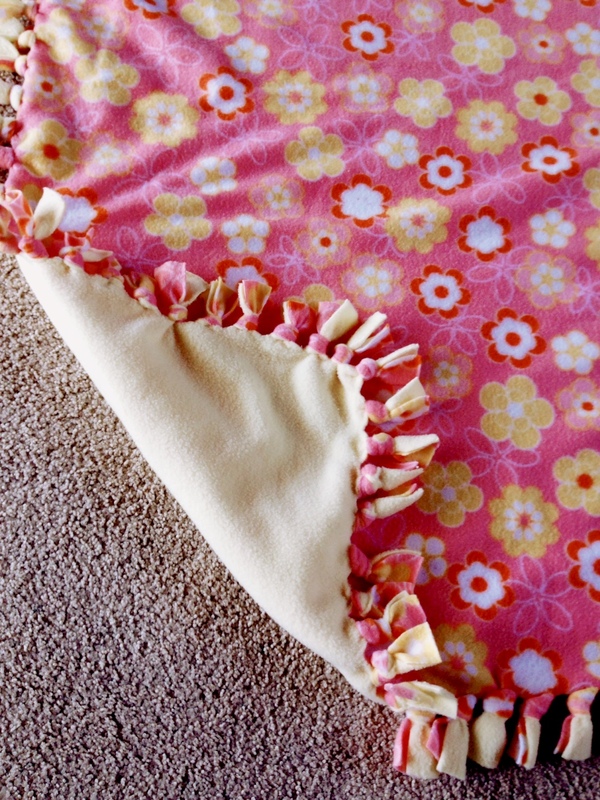 Then lay out your blanket on a flat surface. 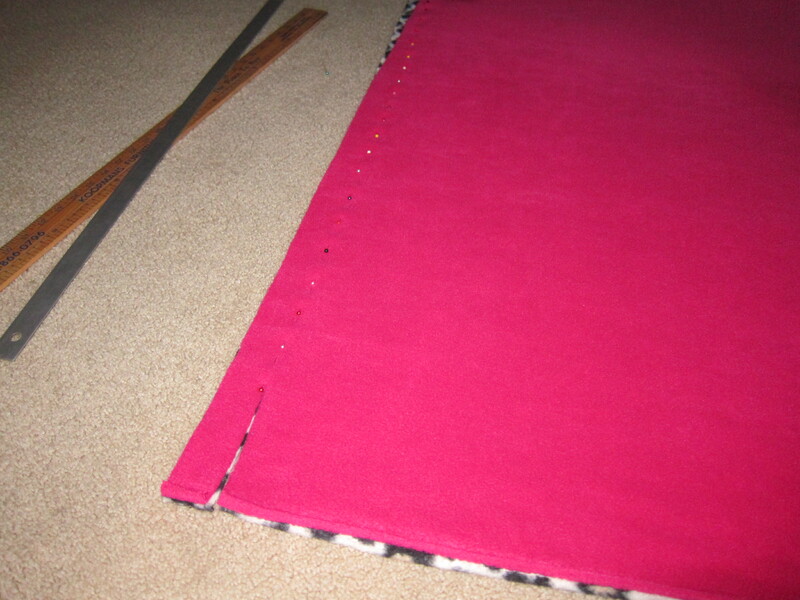 Smooth out the blanket so there are no bumps and then use the yard stick to measure and carefully trim off any extra pieces so it’s nice and even on all sides. I used pins to secure both pieces together so they don’t shift around when trimming the sides. Unfortunately I just realized I failed to take a picture of the two fleece blankets laid out with the 4 x 4 size corners cut out. 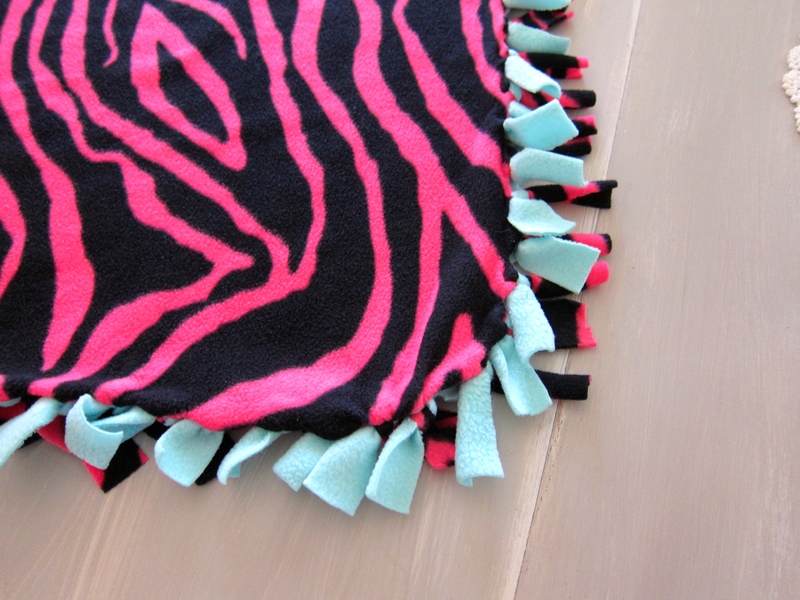 So I had to dig into my stash and found a patterned piece of fabric and a solid contrast to go with it just so I could kinda simulate the steps I did when I made the fleece blankets. Ok so now you get the idea? 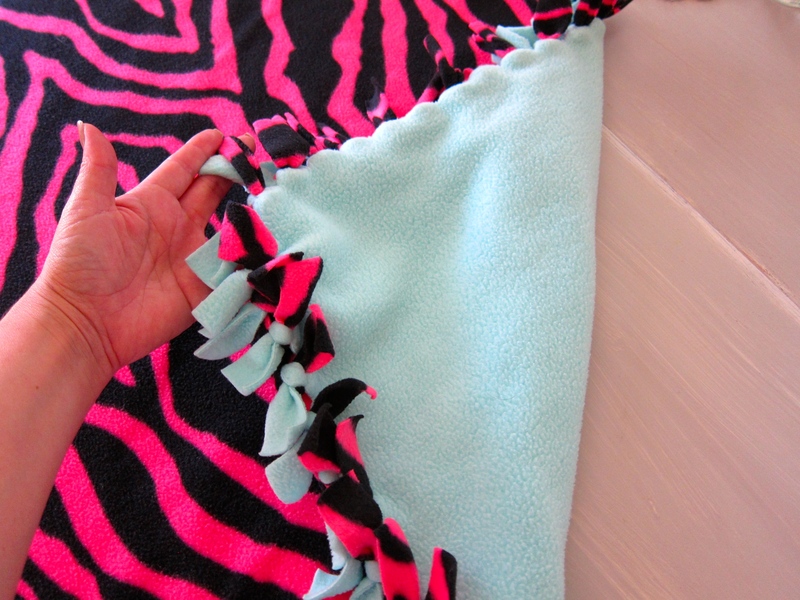 Be sure to cut 4 x 4 corners out of each corner of the blanket as it is laid out in front of you. 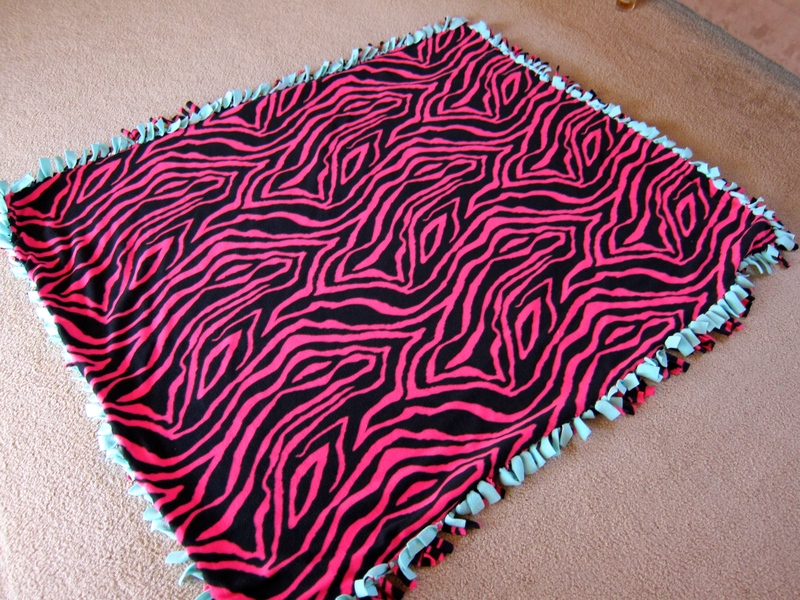 The following pictures are that of the first blanket I made for my oldest. 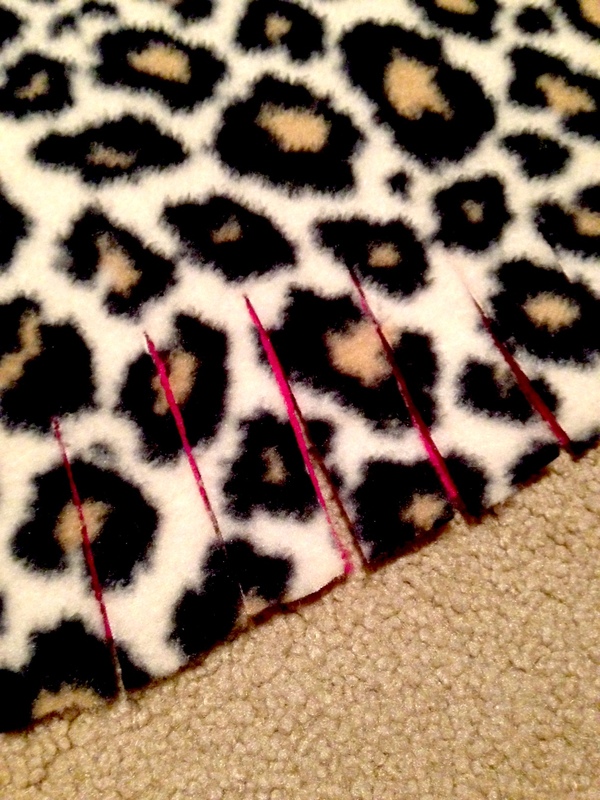 As you can see she really loves the cheetah print with the pink contrast. She’s such a styling girl, what can I say! Now it’s time to cut the fringes. I cut them about 4 inches long and about 1 inch wide. Like so… Then the final step is to tie the knots. Now I know there are different ways to tie a knot and you can use any knot that suits your preference. Just be sure to double tie the knots so they don’t come undone. 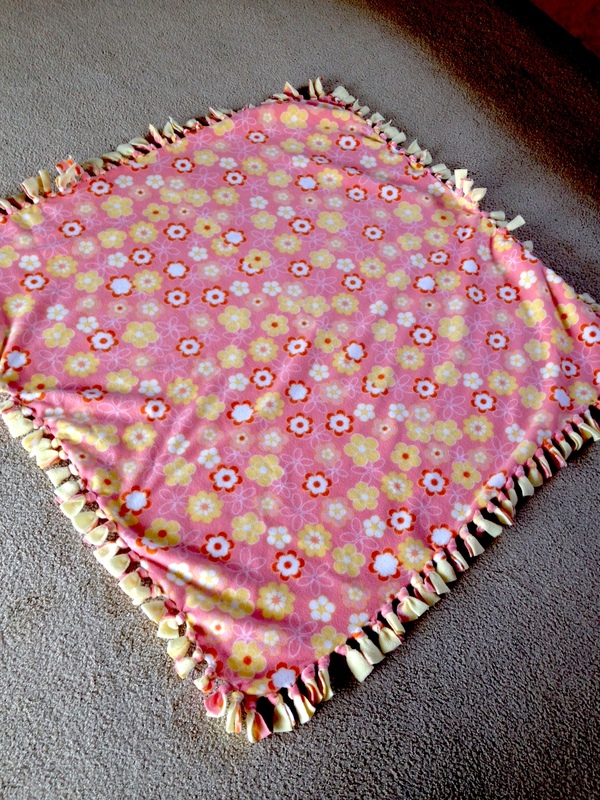 Here’s the second blanket I made for my youngest. She saw the one I made for her sister and just HAD to have one too. She picked out her pattern and contrast fabric herself. Looks like I’ve got two girls that are stylin! 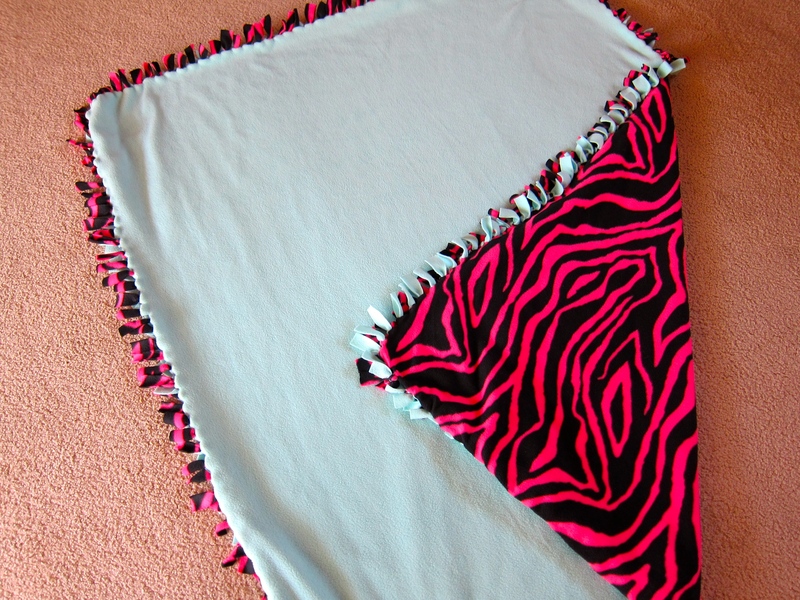 Oh look I found a picture I did take of the four corners cut out when I made the second blanket. 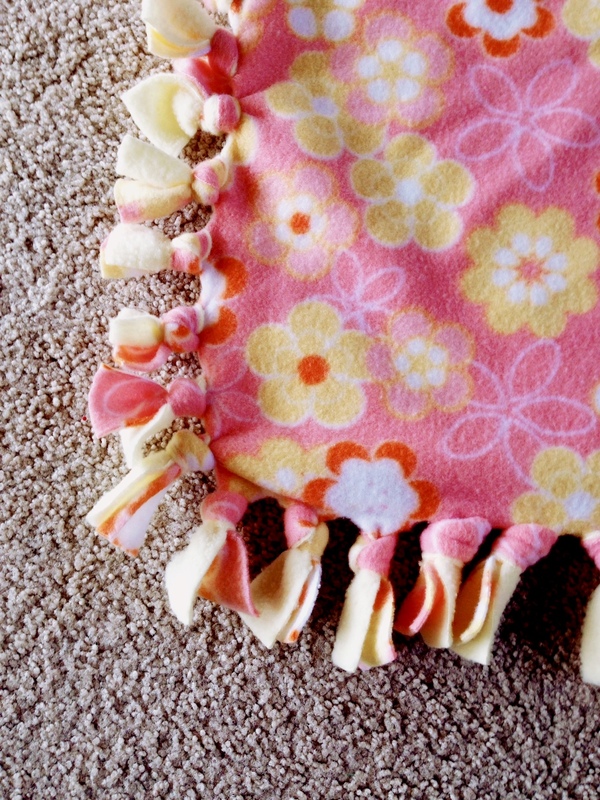 And the last blanket I made was for my niece who is having a baby soon. Can you tell by the pattern what she is having? 🙂 Hope you enjoyed my tutorial. Please feel free to comment, like or follow me. Have a fantabulous day!